An open doorway reveals the main entry to a hospital facility, framed by darkness, scored by the angry footsteps of unseen men who gradually filter past a gently advancing camera. Through the opening, in pursuit of the advance guard, more men barge in, bearing weapons; a man is beaten up against a wall in a bathroom off to the right, while in the corridor the three determined leaders of this hirsute, disorganized crew enter together—a lone point of formation amidst the growing mayhem. In another room off the hallway, overturned beds, their occupants spilled to the floor, flailing in agony. One tries to escape, is pulled back into the melee. A turn to the right reveals yet another room in which a man beats a metal pole in vain against some sort of medical diagnostic equipment; frustrated, unable to break it, he tosses it to the floor. The attacks continue, more men (how many? Dozens? Hundreds? Ten?) enter, violence increases, yet the overwhelming sense is one of peculiar silence, without yelling (in pain or in anger), the fighting assumes a somber cast. Back in the hallway a lone man flings papers from a cabinet across the floor and scurries off to join his fellows. A darkened room at the end of the hall appears to be the locus of the rioting now; latecomers with sticks rush by as the camera creeps silently, inexorably down the hallway. Glass shatters, men rush from the end doorway into yet another room, this time the camera shows its hand, turning slightly to the right in advance of their motion, the only such instance of omniscient foresight thus far. Tracking forward over a wall, darkness for a second, sounds drop in the distance like musique concrete, not the babbling cacophony one would expect in the midst of a riot. Another victim tries to run and is thrown roughly to the floor while another attacker overturns his bed, seemingly the main outlet open for violence against objects in the ward. Into the main room, struggle everywhere, rows of empty beds, bodies on the floor. Another room off to the right, the complex appears endless. Pointless destruction in every corner. Two of the three leaders enter, rip down a silvery shower curtain blocking their path, and unexpectedly pause. Mihály Víg’s otherworldly theme for violin and piano blooms. In front of them, the object that stopped the violence: an ancient man standing naked in a bathtub and bathed by an otherworldly light. He lowers his head slightly, resigned to his fate, utterly defenseless. Tarr’s world comes to a shuddering halt in the face of unlikely beauty. The two leaders look at each other, aghast, turn around, slowly file out, troops following behind, all bearing the palpable shame of their actions. Silhouettes, shadows rather, shades of the generally moral men they were prior to this evening’s activities. Víg and Tarr, sound and image respectively, bear witness. After the men leave, a nook in the hallway reveals a heretofore unseen observer: innocent, impressionable, slow-witted János has been watching the chaos all along. His gaze is frozen, hard, into the camera, almost accusing the viewer of culpability: is it so easy to drive men to destruction? In Tarr’s crumbling universe, one, unbroken eight-minute span is all it takes. How to marry words to these of all images? I’ve expended over 500 thus far just to recount the basic happenings contained within the bounds of the shot, but still so much is missing: the play of fluorescent light and shadow in Tarr’s stark black-and-white compositions (by a set of cinematographers led by usual collaborator Gábor Medvigy); the pitch-perfect, nearly decrepit interiors of a post-Communist medical facility; the shared anonymity of the patients and intruders. It was Eisenstein who famously dissected the cinematic perspective in Dickens, breaking the master raconteur’s sentences into a series of shots that skillfully direct perspective from detail to detail as if one were unpacking a miniature Hogarth frame. In reverse, though the substance of Tarr’s hospital riot might be easily described with the terse reportage of Hemingway, its essence can only be captured in something like one of Faulkner’s gargantuan run-ons given that the shot fully collapses its discrete incidents in an overwhelming, frightening unity. Or, more appropriately, in those of author László Krasnahorkai, whose The Melancholy of Resistance (a title, which in some ways also works to encapsulate this spirit of the shot at hand) is the basis for Werckmeister Harmonies, and whose other collaborations with Tarr, Damnation and Sátántangó, form the triumvirate of the filmmaker’s major works. The hospital riot is perfectively adaptive: at once true to its literary origin and wholly cinematic. In a cinema so obsessed with the idea and integrity of the shot, singling out this one instance for examination is a gesture worthy of Solomon. As the climax of the preceding 90 minutes of slowly building tension, the hospital raid will no doubt stand out for most viewers after first seeing Werckmeister Harmonies, probably the most accessible of Béla Tarr’s films (it’s also the most likely to convince the uninitiated to see another). But the opening’s drunken celestial bodies display, János assisting his uncle Gyorgy into bed and cleaning his apartment, or any of the lingering fog-shrouded moments in the town’s main square (especially the last, with Gyorgy coming face to face for the first time with the dead whale—the inanimate wellspring of so much destruction) are worthy of similar dissection: they all resonate like mini-epics in their own right. Among Werckmeister Harmonies’s wealth of lengthy single-shot sequences, the hospital attack is a narrative climax due to its contents only; otherwise it fits comfortably among its similarly extended brethren. There may be only two other filmmakers working today who move their camera so regularly and with such assuredness: Olivier Assayas and Hou Hsiao-hsien. Of the three, Béla Tarr might very well own the shot-as-sequence. Tarr’s most recent filmed work, the prologue for the omnibus Visions of Europe, is just that: a single lengthy tracking shot (about four and a half minutes) down a line of homeless men and women waiting for a soup kitchen to open, backed by a typically whirring, melancholy Víg composition. The motion is inexorable, like a physical law—once his camera begins moving, it often stays so, until finding the appropriate place to rest. By eschewing editing until it’s absolutely necessary, one might think that Tarr’s project strives to bring his viewers into a closer ontological relationship with that object being filmed. The exact opposite is the case: In the face of conventional notions about cinema viewing and construction, Tarr’s epic takes only work to make the events in his films even stranger, more distant from anything resembling our reality. The long take need not be an attempt at naturalism, and in Tarr’s hands, his plodding, omniscient, melancholy camera pushes viewers towards a more abstracted, contemplative mode of viewing. The hospital scene is terrifyingly real in its violence, but we spectators are kept apart from it all (the muted sound design helps here), more able to ponder the implications of what we witness, always in full realization that we view these events through a window and that there is someone else very much in control of what we are allowed to see. Immediacy in cinema (of the United 93 variety) is facile shorthand for reality—the effects are more instantaneous, but shorter lasting. It’s statelier cinema like Werckmeister that truly resonates. The length and complexity of the hospital sequence raises the question of intentionality—is the power of this (or any) shot derived wholly from authorial intent, created somewhat incidentally, or a combination of both? Especially given the limited resources afforded Tarr to make his films, how much of what we see is under his full control? Is the shot then more impressive a magic act because of these limited resources? (I’d be unsurprised to find that the group of attackers consisted of only a handful of men cycling between the rooms.) What kinds of behind-the-scenes machinations are we missing, especially in a shot that seems so focused on drawing our attention in one direction and then another; the overall effect not unlike looking through a slowly moving tunnel? We hardly notice we are being led: All that is truly important here is the singular unity of shot and action, and that we bear witness. There are no carefully placed signs or symbols to decode, no frames canted to send a message, only implacable violence and our inability to do anything but watch. The camera could move left instead of right, choose other rooms to enter, and we’d still find the same things. Tarr sets the world in motion, then traverses it slowly, and curiously. 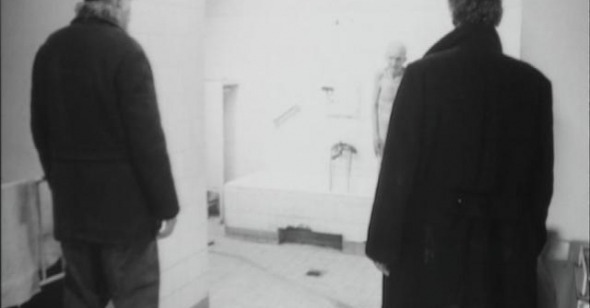 It may be his background in social realism that allows Tarr the leeway to mingle the fantastic (a whale in a truck) and the mundane (János stacking dishes), but the result is a cinema of unparalled strangeness, which finds its quintessence within the walls of a violent night in a decaying hospital ward. Here, his tropes of uncertainty, madness, conspiracy, the fantastic, and unexpected beauty all collide in the course of one improbable, heroic shot. By its end, when the force of its utterance finally catches up, when we realize that we’ve just seen an event, we’re ripe for the devastating conclusion. Even watching the shot apart from the rest of the work creates the same response. Forget special effects, computer graphics, jackhammer editing—here is cinema as raw and primal as the Lumière shorts must have seemed in the early days of the medium, now buttressed by the addition of a dolly and a century of film history. Filmmakers avoid these kinds of shots because they’re not readily imagined, difficult to execute, and expensive in failure. Editing then naturally becomes the preferred method for moving through cinematic space. But occasionally, a filmmaker like Tarr emerges and steadfastly refuses that break, the easy option, and reminds of the simple power in a shot, unbroken, and slotted in line amidst other gargantuan takes. The length of his shots make his few edits even more powerful. In eight minutes Tarr’s made a shot into a sequence into a world. At the opening of the film, our hero János describes for us the entire universe of celestial bodies—ultimately Werckmeister Harmonies seems almost as vast.